While the practice of exchanging diplomatic gifts has been in the core of diplomacy since ancient times, it was the Nazi and Fascist administrations that expanded, rationalized, and systematized it. An elaborate system of gifts and counter-gifts, in which a balance of power and control is reflected, was publicly demonstrated as a series of spectacular manifestations. The exchange of diplomatic gifts between fascist regimes of the Independent State of Croatia (1941-1945) and its respective ‘patron states’ is in the focus of this exhibition, based on primary documents, published press information, and newsreel series regularly released in German, Italian, and Croatian cinemas of that period (Die Deutsche Wochenschau, Il Giornale Luce, Hrvatska u riječi i slici). After the fall and capitulation of the Kingdom of Yugoslavia, the Independent State of Croatia was founded under the patronage of National Socialist Germany and Fascist Italy, on 10th April 1941. The leader of the Ustasha movement, Ante Pavelić, was chosen as the head (Poglavnik) of this new state. 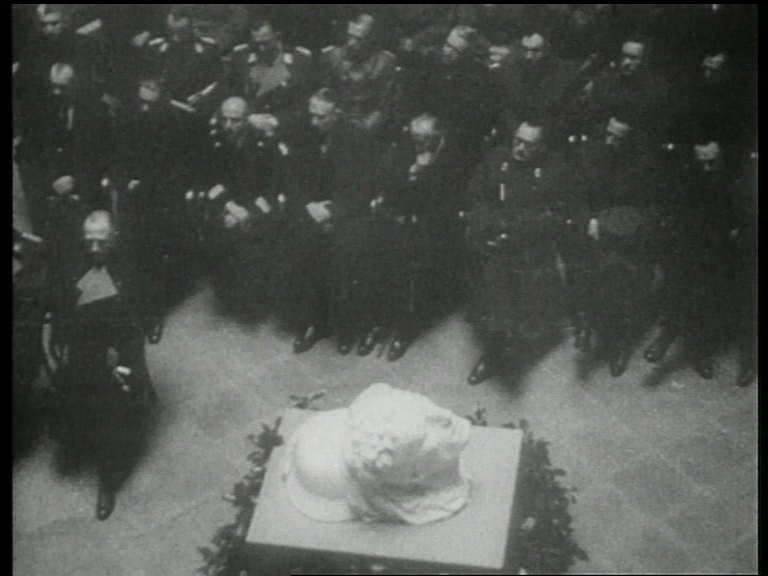 The Poglavnik drew his power from the principle of the transfer of authority from the Führer and Il Duce. The transfer of power that asserted the authority of the Poglavnik was presented to the public through very carefully directed productions, planned for every occasion. Cultural events of ‘proper content’ were especially suitable for this kind of presentation. The transfer of a medieval monument, bearing inscriptions dedicated to the assumed ancient Duke of Croatia, from the Italian Correr Museum to the Croatian Academy of Sciences and Arts (https://exhibit1.transcultaa.eu/), or a great exhibition of German art presented in the exhibition halls of the Strossmayer Gallery – which had then been completely emptied due to the dangers posed by war damage – were pompous public spectacles whose aim was to legitimize the alliance of the Independent State of Croatia with Fascist Italy and the Third Reich, as well as the congruous authority of the new regime. Ceremonial opening of the exhibition Deutsche Plastik der Gegenwart, snapshots from Hrvatska u riječi i slici (Croatia in words and pictures), no. 19, April 1942. The act of diplomatic gift-giving is a specific form of socio-political and stately activities, developed in order to create an atmosphere of trust, content, and partiality, which all served to improve negotiations and enable the realization of various missions. To cement allegiances and, at the same time, to position a certain state in relation to Germany, was of great importance for the Nazi administration. 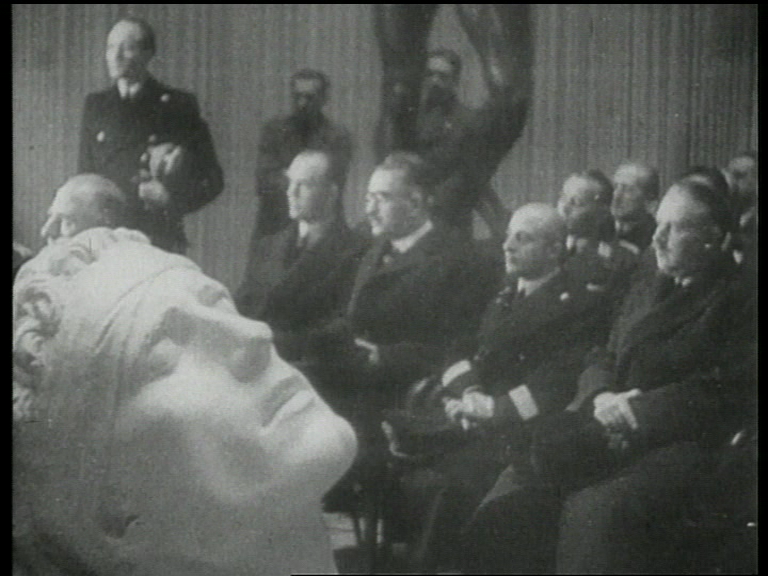 Adequate presentation in the press and on film was a powerful instrument for the promotion of ideological and political goals of the German diplomacy. 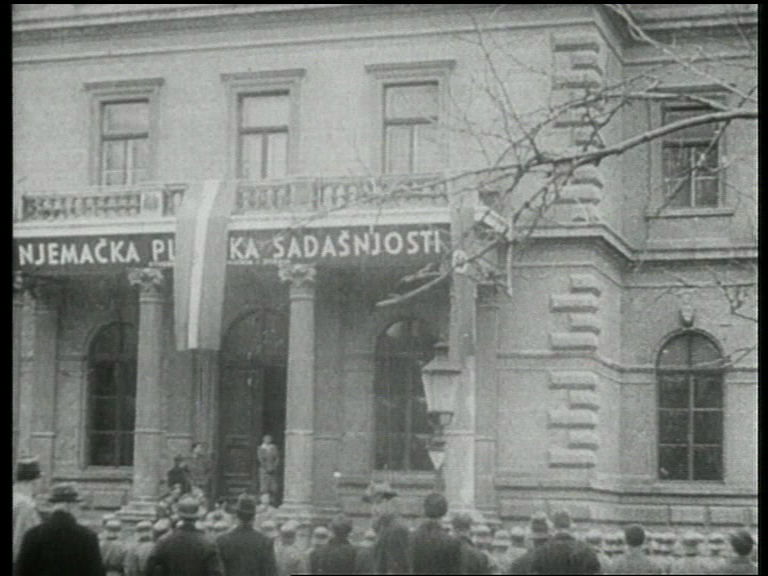 In the beginning, the newsreel medium was played before the main film in the cinema, and later on it even moved to the main city square, where it was available to the widest audience. This medium’s special role was to disseminate the portrayals of meetings between high dignitaries, which were carried out like a court mask, captivating the audience with their perfected performance. However, when globally spread, it provided a means of manipulation realized through clearly established social, political, and ideological norms. Hitler’s Berghof was a constant venue for formal meetings, which ritually began with an introductory salute, followed by a stroll to the Tea House or Eagle’s Nest, which usually included a shot of the landscape or other immediate surroundings. What followed was a brief formal talk (often accompanied by the signing of new agreements that were the direct reason for the meeting). The central act of this protocol was the ceremonial exchange of diplomatic gifts. The choice of diplomatic gift materializes the essence / value / culture / achievements, or will of a certain nation, in a certain political moment. 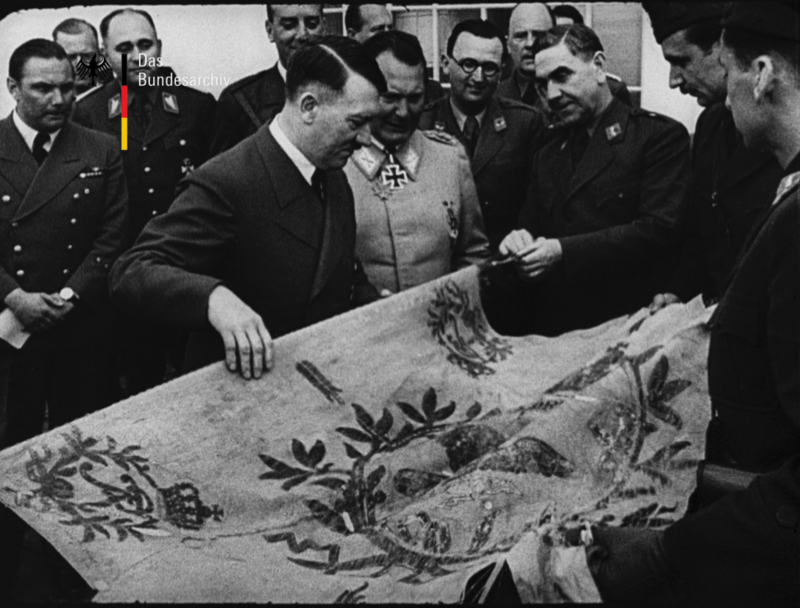 During his first meeting with Hitler, Pavelić presented him with the flag of the Prussian King Friedrich II, and his chess figures. 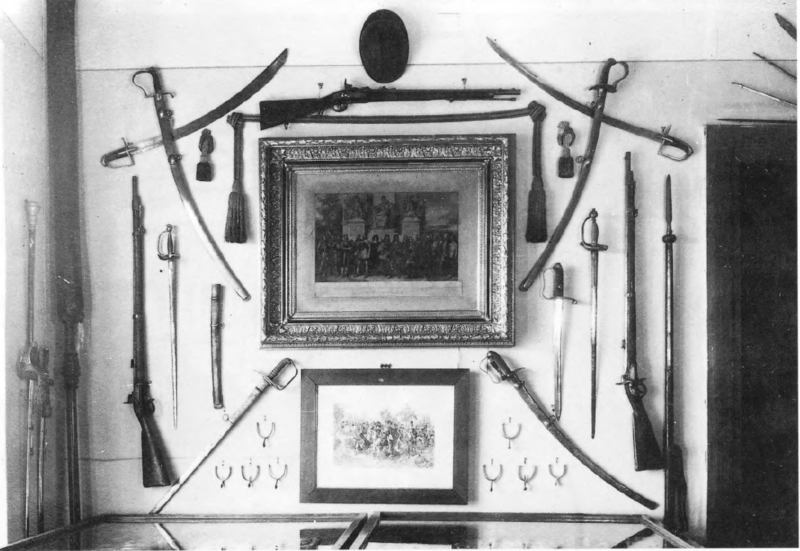 These were allegedly confiscated by Croatian soldiers from the tent of Friedrich himself during the Seven Years’ War between Austria and Prussia (1756-1763). 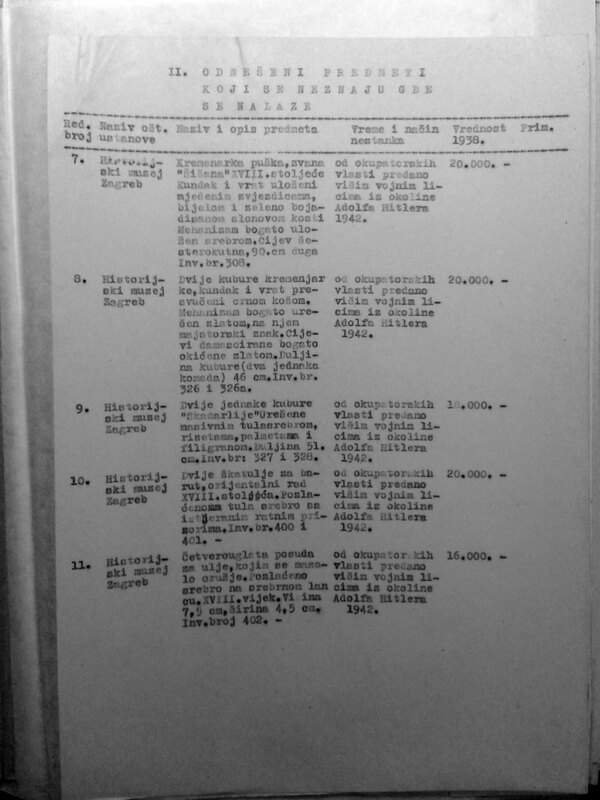 This gift not only enhanced Croatia’s military spirit, but acknowledged the overarching power of Hitler: considering the significance and standing of the person to whom the gift was presented, diplomatic history recognizes the chess game („Spiel der Könige“) as recognition of royal status. The German diplomatic administration, which perfected the protocol of diplomatic gift-giving to the smallest detail, traditionally presented foreign allies with luxurious objects that promoted Germany’s political and economic supremacy through technological progress and skill. 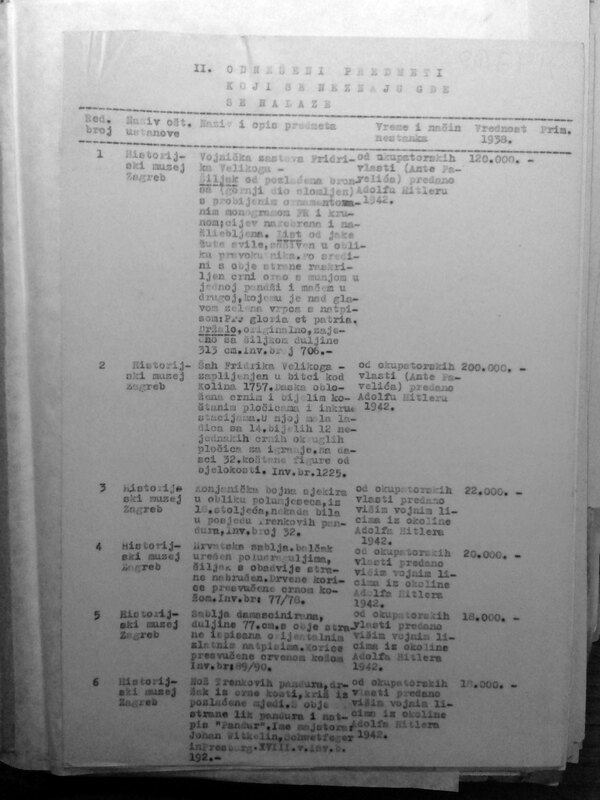 An example of this kind of transaction was a limited edition Mercedes car created precisely for the diplomatic gift-giving protocol, which was received by the Poglavnik of the Independent State of Croatia, among others, one year after his first meeting with the Führer. The time lapse between the gift and the reciprocated honor was a very important aspect of diplomatic exchange. A longer time lapse was preferred so as not to degrade the value of the gift. In the meantime, Pavelić ‘earned’ this gift by proving himself a true partner (or vassal) – the limousine arrived in Zagreb as a symbol of gratitude for the participation of Croatian soldiers on the Eastern front. Apart from their assumed material value, these kinds of gifts also include non-material components, while the non-verbal communication between the political and social relations is recognized in the very protocol of the gift-giving. The surreally honest, almost child-like playfulness of the gift receivers, who were obviously fascinated with what they had received, seems almost uncomfortably inappropriate. The government of the Independent State of Croatia preferred to give away ancient weapons and other artefacts that evoke the military history of the Croatian people. For this reason, Pavelić gave Mussolini a richly embellished sword that, supposedly, dated from 14-15th century, and belonged to the ancient Croatian family Frankopan. As such, is was seen as a symbol of the long history, success, and wealth of the Croatian nation. The gift presented to Croatia’s dignitaries by the Italian delegation (at a lower, but still diplomatic level) contains a prominent component of artistic ‘national’ heritage – a small cast of the equestrian sculpture Gatamelata. The gift stands not only for the successes of this legendary military leader, but for the Fascist appropriation of Renaissance Art embodied in the famous work by the Florentine sculptor, Donatello. 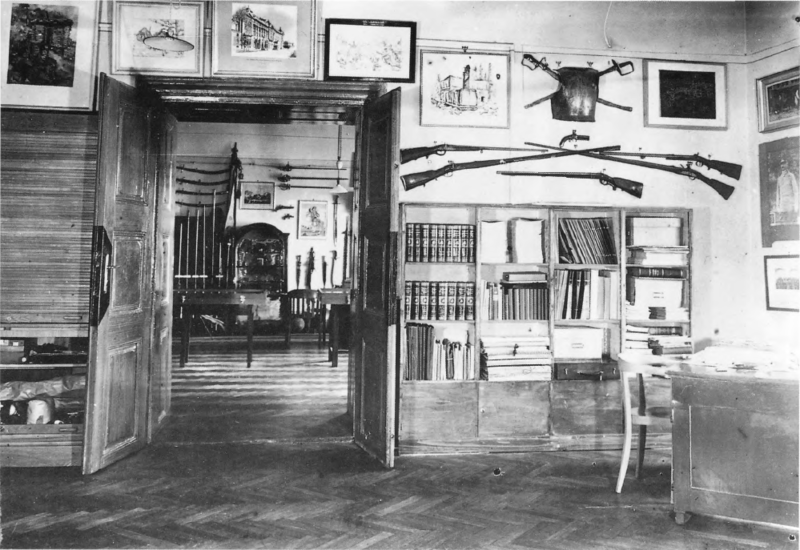 Ancient weapons given as gifts for diplomatic reasons were taken from the weapons collection of the War Museum and Archive in Zagreb. This museum was founded by Pavelić on 26th May 1941, with the aim to glorify “the famous and noble military history of the Croatian people”. The collection of the newly founded museum was comprised of appropriated objects from private collections, as well as from the Museum of Croatian History, and other public museum institutions. All museum objects share the characteristic of being extracted, at a certain point in time, from the primary context in which they were created, in order to be collected, stored, safeguarded, and exhibited as museum artefacts. At some point in history, however, some of these were selected to become stage props in a political play. Today, they may be sold and deposited in an unknown location, lost or destroyed. In any case, these cultural objects have been translocated in different ways, obtaining their symbolic capital through the various mechanisms of the process of transfer from one context into another. 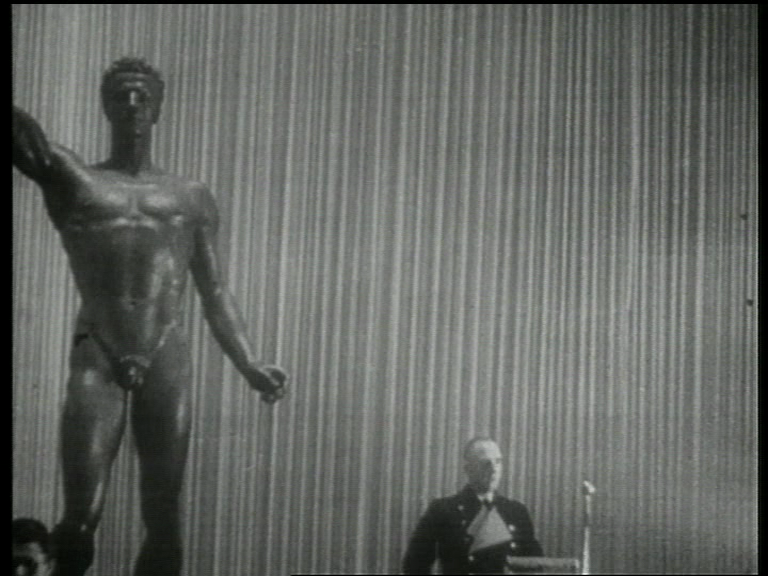 Fascist diplomatic gift-giving performances proved to be an extremely potent spectacular ritual to serve this purpose. National Archives and Records Administration, Washington D.C.
Research for this online exhibition has been carried out in the framework of the HERA project 15.080 TransCultAA (Transfer of Cultural Objects in the Alpe Adria Region in the 20th Century, http://www.transcultaa.eu). This project has received funding from the European Union’s Horizon 2020 research and innovation programme under grant agreement No 649307.